First things first, Hyundai Elite i20 pays no resemblance to the outgoing model of the hatch, at least in the exterior appearance. The Fluidic Sculpture 2.0 design philosophy is quite contemporary, quite similar to the one that Peugeot (a French automaker) cars adorn. At the front fascia of the exterior, the wrap-around headlamps, all-new hexagonal grille with chrome linings, wider air dam and hood character lines are some of the highlights. The all-new body-coloured front bumper has wide and distinctive trapezoidal fog lamps integrated. However, the aforesaid feature is not on offer with the base Era trim. Coming to the side profile, due to the enlarged size of C pillar, the roofline further looks sporty and slopy. Both B and C pillars are engrossed in black colour. Additionally, there are body-coloured door handles and ORVM with turn indicators in all the variants of the hatch, except for the Era, where they are present in black shade. Even the top-end variants – Sportz (O) and Asta have been bestowed with chrome door handles and premium dual tone, 16-inch diamond-cut alloys. Talking about the rear profile of the hatchback, the company has introduced an all-new ‘Boomerang’-shaped tail lamp cluster, which further accentuates the stylishness of the car. Again, on the inside, the changes are not easy to spot. The fabric on the seats now has a hounds-tooth pattern, which is a cool, almost retro touch. Some of the buttons and controls on the steering wheel and dashboard new too, the central AC vents have been redesigned slightly and the touchscreen has a matte finish so it’s easier to see in bright sunlight. In terms of equipment, it’s still up to the same high standard as before, except one of the 12v charging points has, handily, been replaced with a USB charging outlet (this is separate from the USB port for connecting devices). The touchscreen is one of the best around, with Apple CarPlay and Android Auto, and a simple, clean and easy-to-use interface. At the rear, you now get ISOFIX mounting points, and a fold-down armrest, which is a segment first. Hyundai is offering the Elite i20 with no changes to the powertrain. There are two engine options – a four-cylinder 1.2-litre petrol engine producing 82bhp and 115Nm of torque and a 1.4-litre diesel motor delivering 89bhp and 220Nm of torque. The former comes mated to a five-speed gearbox and will get an automatic transmission (CVT) later this year. The diesel continues to be mated to a six-speed manual gearbox, which is the model we have sampled in this test.The Elite i20’s diesel engine is a promising one by being the most refined, smoothest and most tractable unit in this segment. Only a slight engine noise can be heard in the well-insulated cabin, making this mill the quietest amongst competitors. This diesel unit is extremely refined and delivers enough punch for daily driving with loads of torque available at low rpm. The turbo lag is minimum and revs nicely till 5,000rpm while remaining pleasantly smooth even near the redline. So whether it’s slogging through traffic in the city or cruising on the highways, the motor feels apt for any purpose. The six-speed gearbox is well-tuned to offer light and precise gear shifts. On the flip side, I wasn’t able to slot it in reverse quickly and the clutch pedal felt springy. Nonetheless, this transmission backs the engine well to offer a pleasant experience. In a bid to make it a bit more engaging to drive, Hyundai has also tinkered a bit with the suspension and the steering of the i20. They’ve stiffened the rear suspension a little bit and you can feel that in the way the car isn’t quite as bouncy coming off a large speedbreaker, for instance. They’ve also sharpened up the steering a bit and reduced the slack at the centre position to make it feel a bit more engaging than before. Truth be told, this is still no driver’s car, and to truly improve the dynamics would require a full generational leap – as we saw with the new Verna, but it’s good to see Hyundai is trying to improve things on the current-generation car. Now on to the ride and handling department. The Elite i20’s steering drew a lot of flak earlier and the Koreans still need to work on this. 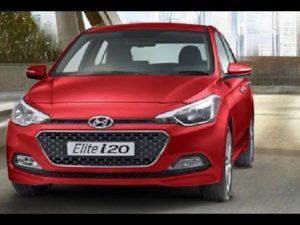 The Elite i20 still doesn’t make for driver focused and most connected car. Though the steering is light it isn’t direct and still vague at the centre. The brakes too aren’t progressive and the late brake bite doesn’t instil confidence in hard braking. On the plus side, the Elite i20 has a sorted ride especially at slow speeds. The well-tuned suspension will absorb bumps and sharp potholes with ease. There’s no clatter from any body part and so poor roads are not an issue at all. However, as you throw the car into a corner you realise the body roll come into the picture. It doesn’t feel very agile and responsive around these bends. Also, built up some speed and the car still tends to wallow a bit. Nonetheless, this up and down movement has considerably improved over the old model. In any case, the car feels planted and smooth to drive. Hyundai has incorporated a decent braking system in the hatch, which consists of disc brakes on the front and drum brakes on the rear. It is supported immensely well by the Anti-lock Braking System (ABS), but that is limited to the top three variants. Earlier, Hyundai i20 used to be the only hatchback under Rs. 10 lakh that offered as many as half a dozen airbags and was impeccably safe. But, now the scenario has reversed as even the top-end trim has only 2 airbags. The base and mid variants don’t feature a single airbag, while the Sportz trim comprises of only driver’s airbag. The parking assist feature with reverse parking sensors and rear camera with ECM display comes handy during parking the hatch. There are front fog lamps to improve visibility in inclement weather conditions.But, again, both the aforesaid features are with Sportz and Asta trims. Additionally, the top-end trim also features seat belt pretensioners for the driver and front passenger, automatic headlamps, impact-sensing auto door unlock and clutch lock. On the security front, it has immobilizer, smart keyless entry, and central locking (door and tailgate) to endure any event of burglary or thievery. It can be propounded nonchalantly that the current gen Elite i20 stands nowhere close to its predecessor in terms of safety features. The company has disappointed thoroughly in the safety and security aspect. Overall, this facelift appears to be a case of ‘if it ain’t broke, don’t fix it’, and really, not much was broken with the Hyundai i20. It’s also worth remembering that Hyundai has been giving the i20 small, regular updates over the years, particularly to the equipment list, and this is why the facelift doesn’t feel as much of a change as most facelifts do. The long equipment list couldn’t have gotten much longer and the interior quality was already pretty much at the top of the class. Even the changes to the engine mapping are very minor. What is much appreciated is the small but effective attention that’s been paid to dynamics, for whatever it’s worth. So yes, the i20 hasn’t changed all that much with the facelift, but then, it didn’t really need to.